The theft of iOS devices is rampant throughout the world, but Apple obviously doesn’t want people to have to hide their iPhones in fake Blackberry cases to use them in public without fear. Phone carriers could dramatically reduce theft by refusing to activate stolen phones (every device enabled for cellular service has a unique hardware ID), but so far the carriers have been slow to act. And even if the U.S. created a registry of stolen phones, it’s unlikely all foreign carriers would follow suit, so the bad guys would simply ship stolen phones overseas. 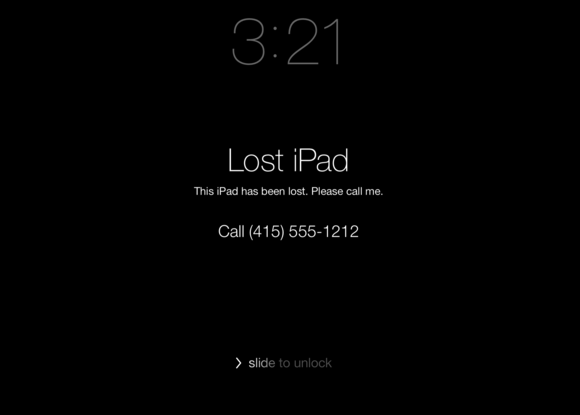 Under iOS 6, it was already difficult for a thief to access your private data, and iCloud subscribers could use Find My iPhone to lock a lost or stolen device and (through an onscreen message) encourage that device’s return. However, a tech-savvy thief could simply force a restore of the phone, iPad, or iPod touch; swap out the SIM card (on a phone); and end up with a like-new device. But there’s good news on this front: Thanks to a new feature called Activation Lock, iOS 7 offers very little incentive to any potential thief. In the Find My iPhone app, when you tap Lost Mode (left), you’re prompted to provide a phone number (center) and message (right) to be displayed on the lost device’s screen. Here’s how it works. As before, when your iPhone (or other iOS device) goes missing, you launch the Find My iPhone app on another iOS device, or on the Web at iCloud.com. Tap (or click) Lost Mode, and you’ll be prompted to set and confirm a passcode (provided the device doesn’t already have one), as well as provide a phone number where you can be reached, along with a message to display on the screen (“I will offer a reward” or “We have you surrounded” or “Please give it back”). 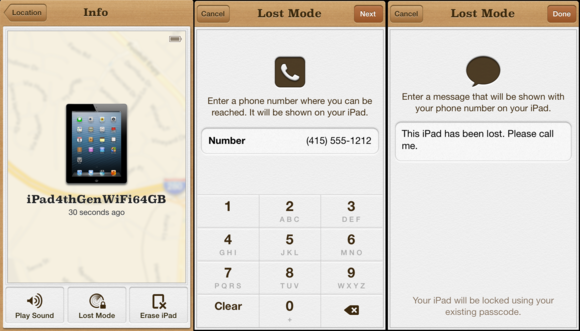 Once you activate Lost Mode, the lost (or stolen) device is locked with a passcode, and your phone number and message are displayed on the screen. That’s all there is to it. The lost iOS device will display your details on its lock screen, and it won’t work until the lock code you just set is entered. If you remotely erase the device, Activation Lock kicks in and prevents the device from starting anew without your passcode.